This classic is a winter favorite, a whole roasted chicken cooks alongside root vegetables. Rinse chicken thoroughly. Put lemon, onion, and thyme into the cavity of the chicken. Sprinkle the skin of the chicken liberally with salt and pepper. Scatter the leeks, carrots, potatoes, and parsnips over the bottom of a roasting pan. Sprinkle the vegetables with salt and pepper. Set the chicken on top of the vegetables. Pour white wine and chicken broth over chicken and vegetables. Roast the chicken for 1 hour until the skin is browned, the juices at the joint of the thigh run clear when pierced with a knife, and a thermometer inserted into the flesh of the thigh registers 180 F. Stir vegetables and baste chicken with juices occasionally during cooking. Transfer the chicken to a cutting board. Lift the vegetables into a serving bowl and pour or ladle the juices into a pitcher or gravy boat. 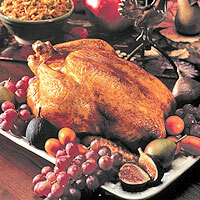 Carve the chicken and serve with vegetable juices.